The update actually launched yesterday, so if you've ducked your head into the game since then you've already noticed this addition. The in-game marketplace will let you buy "Platinum" using your real-world money. 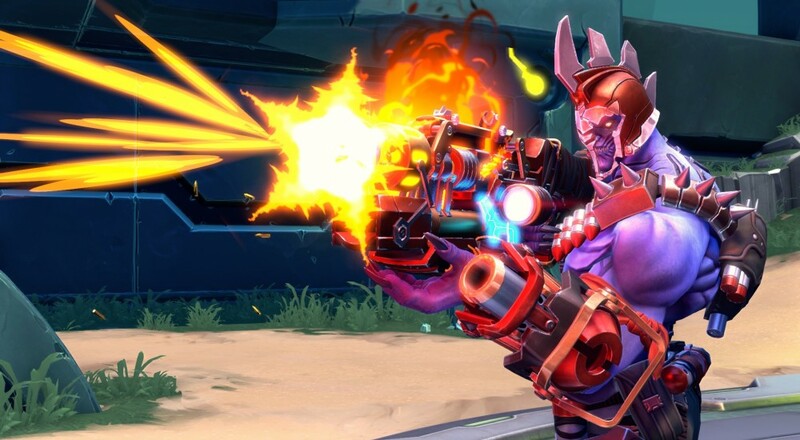 That Platinum, in turn, can be spent to buy new skins for all 26 of the game's characters, and taunts for a smaller subset (Ghalt, Oscar Mike, Benedict, Shayne & Aurox, El Dragon, Whiskey Foxtrot, Kleese, and Alani). More taunts for other characters will be added as time goes on, along with the ability to buy the DLC packs (whenever they get released). The skins and taunts you can buy have no impact on the game itself; these are purely cosmetic items so you can distinguish YOUR Deande on the battle field from the other ones. The five new heroes (of which one is already released and one is on the way) that are being added will still be free and can be unlocked by meeting certain criteria in the game. This model isn't all that different from how Destiny started its marketplace this past Fall. While many folks (understandably) balk at this kind of mechanic getting added to games, it has become a proven method by which developers can still earn money post-launch in order to continue supporting the title. Hopefully, it will remain an optional, cosmetic item only affair, though I always have concerns that items like XP and Credit boosters may not be too far behind. Page created in 0.2659 seconds.